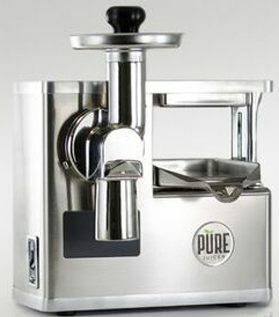 The Pure Stainless Steel Juice Press is the only 2-stage hydraulic Juicer we offer at DiscountJuicers. 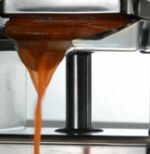 We have owned Norwalk juicers in the past, but have found the quality is lacking and the inherent design flaws can be frustrating. 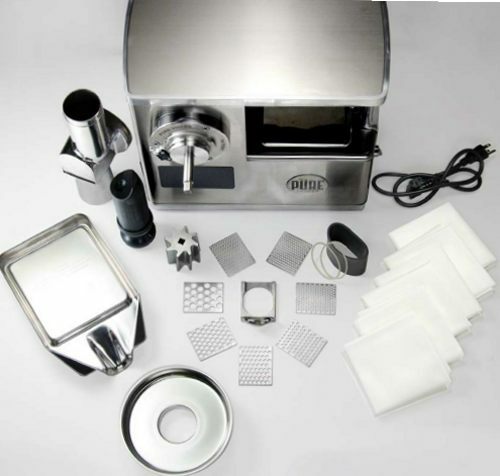 The Pure Juice Press took the basic 2-stage hydraulic press style juicer that is recommended for the popular Gerson Therapy and made it even better. After using the Pure Juice Press, we simply found it to be the best 2-stage hydraulic press juicer on the market. 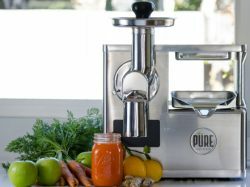 The PURE has the highest output and the lowest cost of any two-stage juicer. This means, if you take every item into consideration that contributes to the cost of owning a juicer the PURE Juicer is the most cost effective product available. The better your juicer the less money you spend on produce. In other words, the PURE Juicer will pay for itself over time in produce savings. Highest quality materials tested with intense scrutiny to make sure the juices withstands even the hardest tries day after day, year after year. In the end this is what really matters. Squeezing even the last drop of liquid out of the produce to capture every enzyme. Even the smartest piece of engineering is useless if its designer can�t make features accessible for its user. The PURE had simplicity in mind from the get go. It is designed based on feedback from every type of user group and build by a team with over decade of experience, embedded in a commitment to serve you for years to come. You will find, that the PURE Juicer is the easiest to clean juicer as well. The Offset Feed Chute prevents spraying produce on the ceiling that can be an issue with competitor models. The specially designed 8 blade hardened stainless steel cutting blade will retain its edge longer and cut more efficiently than the competitors blade. The easy to assemble & disassemble feed chute locks on with a click and is removed by pressing a button. No difficult to use tool or thumb screws are used. 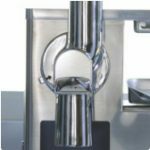 The oversize stainless steel press makes it easier to maneuver your filled pressed cloths into and out of the juicer. The Grid tray mounts flush to the feed chute housing, the low profile means no left to right transfer-snagging of the pulp pack between folding and placement in the press chamber. The pull-tab also acts as a hang tab for juice bags and since the PURE cutter is designed to lock to the motor shaft in use; so the Grid Tray pull-tab is also designed as the release-tab; so that with the lightest touch it freely ejects the cutter. There are also two grid retention tabs so the grids are drawn out with the tray. 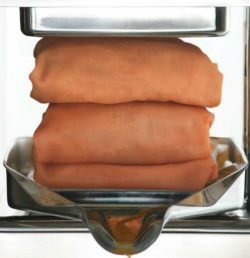 The over-size pressing chamber allows you to press one quart of juice in one pressing. This is up to 20% more than the competitor model. This can save you lots of time when pressing larger batches. The mirror finish press plate can be used to fix your hair! Aside from that it is made for reinforced stainless steel that will evenly distribute the power of the press on your produce to ensure you get the highest yield possible. The protective bumper on the Pure Juicer ensures the stainless steel finish of the Juicer stays blemish free. Just take a look at a few year old competitor model for damage that can occur. 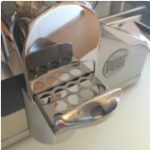 The specially designed pusher ensures all the the produce you put into the grinder is properly shred so it can be juiced. Flat-bottomed pushers may allow pulp that does not get ground up and may spit back up at you.